Content marketing is the bridge between your prospects and your business. In a sense, it is the “voice” you present for your company, and for your products and services. What kind of voice do you want to have? Fun? Caring? Quirky? Professional? When you choose this voice, you will draw to you only people who resonate with that tone. So choose carefully. You want to have people in your circle with whom you enjoy hanging out. The type of people whom you draw to you shouldn’t be a big mystery though, if you have done your homework as outlined in the previous article about Planning your process. Part of that Plan is clarifying your audience and planning how you will Implement your content marketing process. Structuring your content includes such activities as auditing your current content, understanding the life cycle of content, digging into keywords, and creating a systematic process for creating and evaluating great content. Once you know what message you want to share, start with the content you already have in place. This means that – although it may not be fun – you really should do a “content audit”. There are some free online tools to help you – such as Content Auditor from Kapost or Screaming Frog – that will give you a useful report. Use this report to figure out where you need to improve, and keep this in mind as you create your content objectives. What are you looking for in a content audit? Don’t let content marketing remain a mystery! Find out how the pros do it and get an ROI! Remember, you are trying to maximize your prospect’s experience on your site. You don’t want them to get frustrated by such things as broken links when they visit. In addition to helping you find places on your website that aren’t working technically, it will also help you find where the topics of your content aren’t working to capture attention, bring in leads, and convert leads to customers. Once you know what your content objectives are, and you can see what has – or has not – performed well for you in the past, the next step is to make a plan for different types of content. You can actually find a number of definitions for “content life cycle” online. The one I find most useful at this point is to consider the types of content you want at different stages of your funnel – which, again, goes back to your objectives for your content marketing plan. Since the core purpose of content marketing is to acquire new customers and to nurture relationships with current customers, of course the overarching goal of ALL content is to generate leads and sales. You need to have some sort of sales funnel to generate leads and sales, so there are different types of content that help you do this at different stages. The purpose for the top of the funnel is to create AWARENESS of a problem. The purpose for the middle of the funnel is to help your prospect EVALUATE and CONSIDER different options for solving that problem. And the purpose for the bottom of the funnel is to encourage your prospect to DECIDE on a solution, and CONVERT to becoming your customer. Once you understand this “buyer’s journey”, and where your prospect is located on their level of awareness, you are ready to move to strategize your plan. 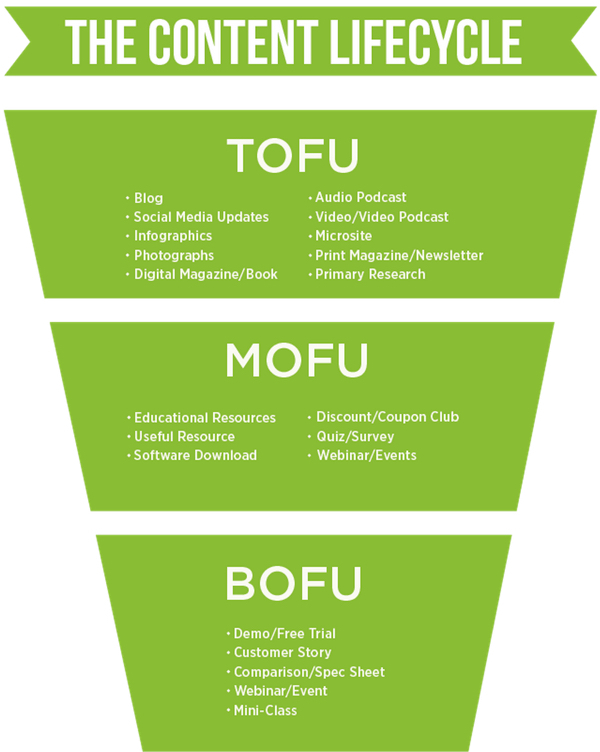 The Content Pyramid by Curata is a great visual explanation of how to organize your investment into content creation. Your strategy includes putting all of this planned content into a calendar. At the bottom of the pyramid are quick, short items such as social media posts. There is relatively little investment of time or money to disseminate that content. The further up the pyramid you go, the more time- and money-intensive the content becomes. You have to feel pretty sure that you will be able to leverage something like primary research into new customers and clients. At the very least, it will certainly garner you “thought-leader” status, if you do it well. 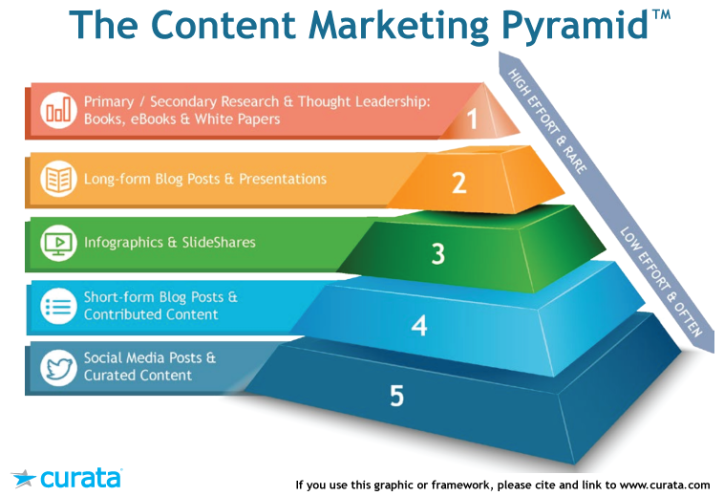 In the middle of the pyramid are the other types of content: short and long blog posts; presentations; etc. It’s possible that you will not get around to the top level; usually only larger companies have the means to do that type of primary research. However, you should plan your content so you touch on all the other types, and cover all three levels of the funnel. We go over how to do this type of planning in our EPIC Content Marketing Formula Club. The three core platforms for sharing your content are: your website/blog; social media, and email. You need to set goals for each platform before creating content (eg, drive traffic, build community, generate leads, build brand recognition, thought leadership, etc.). Your website or blog is the center of everything you distribute on the internet. If you think of it as a “hub with spokes”, you’ll see that everything you publish should drive visitors to your site. Why is this important? Because not only does your site establish you as a credible authority in your niche, but it should also be set up as a lead generation machine. There are a lot of steps to making this lead generation machine really hum, but you can get started by having ONE INVITATION to join your list that you repeat in multiple locations on the site. Some people are successful simply with an invitation to “Get our newsletter”, but most websites need to offer a lead magnet that solves a very specific problem for a prospect who is still low on the level of awareness. Place that invitation in the sidebar of every page, as well as in the footer, and possibly even right at the top of the homepage. The type of social media platforms you choose will depend entirely on where your audience hangs out. Poke around in different platforms to find your audience. “Listen” to the conversations for a bit before diving in. Find out what their biggest struggles and concerns and interests are, and then make sure you address those in your content. Once you know where your audience usually hangs out, you want to use your social media posts strategically. Don’t just use them to distribute your content. Social media is what the name implies – social. You should be using social media to build relationships with your target customers. Respond to their comments and questions. Get your message out there. Monitor and research what is going on in the daily lives of your audience. And post prolifically in order to establish yourself as a thought leader in your niche. There is a lot more that can be said about social media content. We’ll be looking at it in more depth inside The EPIC Content Marketing Club, so be sure to join us there! Finally, email can be an extremely powerful way to provide content to your target audience. One of the most compelling reasons to use email is because everyone on your email list has made a decision to give you their address in order to hear from you. They already know you. Now you can use the content in your email to build the “like” and “trust” factors. And remember the bit about being personal? Email is a great platform for being authentic about your own story, as well as the company story. The final part of the Implementation step is to decide on which tactics will best serve your objectives. It’s totally possible to post a variety of media on one platform. You could have audio, video, and text, all on your website. Or on your most effective social media platform. This is why the strategy comes before the tactics. Know WHERE you want to be seen first, then figure out different media to use once you are there. Brainstorm topic ideas both from what you already know about your audience and from doing your research. Search keywords on Amazon, YouTube, Google, and in online forums. See what other topics are posted, and the questions people are asking. Then plan and create your content. On each of your platforms – website, social media, email – you can reach people who respond best to visual cues with video. For people who like to skim and scan, use text. For people who like to have something educational and interesting to listen to while they do other tasks (like exercising, washing dishes, etc. ), use audio. And consider using interactive content. Right now interactive content looks mostly like quizzes. And there are plenty of surveys out there now, helping businesses gather information about different segments of their audience. –You can now combine what you know about your audience personas with your content calendar to begin creating pieces that speak to specific needs. –You can also combine what you know from the Content Lifecycle illustration with the Content Pyramid illustration, and begin to see where to put your time and effort (and money) when it comes to creating content for different parts of the funnel. –I recommend that you not start out too small, or granular. In other words, plan to support your product launches with valuable content. –Identify who the target market will be for each of those products – What is the core problem the product solves? – and post content around that problem for at least a month prior to the launch. –Put this overarching strategy into the content calendar. –Work backwards, looking at the platforms where you want to post helpful information. Then begin to identify the types of media that you will use as the tactics for this strategy. –Only get this granular about three to four months out. This gives you a chance to test what works, and then tweak next quarter. We have covered a lot of ground in this article, and yet this is the biggest and broadest part of the EPIC Formula! We’ve really only scratched the surface. And if you would like to have some hand-holding in order to dominate your market through content marketing, please join us in the Epic Content Marketing Formula Club!